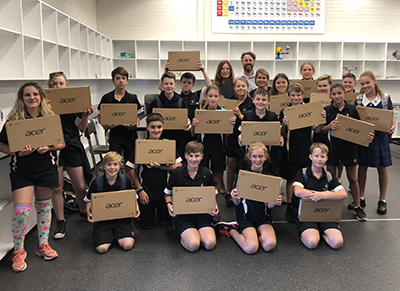 There were plenty of smiling faces as the new year 7 cohort at Mount Stromlo High School received their Chromebook devices today. The Better schools for our kids – technology enabled learning initiative commenced in 2018, with the ACT Government offering a Chromebook device to every public school student in Years 7 to 11. This year the initiative extended to students entering Year 7 as well as new students in Years 8 – 12 entering the ACT public secondary system. Minister for Education and Early Childhood Development Yvette Berry was on hand to help deliver this round of Chromebooks, ensuring that - irrespective of family circumstances - every student has an equal opportunity to learn wherever they are and whenever they need it. The students new to the ACT public school system were thrilled to receive their device today. “The experience is so exciting, especially with the touch screen. I will use Google files and docs to do assignments and studying for exams too,” Year 7 student Ryan Forster said. Owning a device provides a great opportunity for students to expand their learning journey and we have seen some great examples of the use of devices to enhance classroom activities in ACT public schools. Mount Stromlo High School ICT Teacher Stefan Latham said that there is great uptake within the school. “The teachers have enjoyed the program because of the equity it brings,” Mr Latham said.